What is a Blunt and How is it Different from a Spliff? The way cannabis is consumed today has dramatically changed over the last few decades, especially with increased legalisation and vaping as a cool and ‘acceptable’ way of consuming cannabis. In today’s modern culture of vaping and dabbing, the very simple, very old school, and very satisfying art of rolling a ‘fatty’ is often not considered. However, for many seasoned and old-time cannabis users, rolling up cannabis in paper is one of the most enjoyed and tried-and-true methods of smoking the recreational and medicinal drug. You may be new to cannabis – in which case, there are three common ways of rolling up and smoking it: spliffs, blunts, and joints. However, for the sake of this article, we’ll be focusing on the first two. Since spliffs and blunts are rather similar in nature, cannabis consumers often confuse the two – after all, they are seemingly identical but that doesn’t mean they offer the same psychoactive effects; both use different ingredients and cannabis concentrations, for one. If you’ve ever smoked cannabis rolled up into a joint, you can quickly grasp the concept behind a blunt: it has roughly the same size and shape of a hand-rolled cigarette – so it’s small and thin, particularly when you put it right next to a blunt. However, one property that sets apart a joint from a spliff is that the latter has tobacco mixed in some form with the cannabis. Therefore, you might call the contents of a spliff a hybrid in a sense, because there’s typically a 50/50 ratio of tobacco and cannabis. As a cannabis user, you may enjoy smoking spliffs more due to the nicotine buzz that comes with it, much the same as the ‘pick me up’ feel-good buzz you get after consuming coffee. However, many cannabis purists tend to steer clear of these green and brown rolled up concoctions. In What Parts of the World are Spliffs Common? It appears, and this is probably not by coincidence, that spliffs are more commonly smoked in regions where good quality, inexpensive cannabis is not easily available. Furthermore, in places where smoking cigarettes is a common cultural phenomenon, smoking spliffs as a social activity or recreationally in the privacy of one’s home isn’t exactly unheard of. The UK actually happens to be a very good example of just that – UK folks love their cigarettes and since cannabis has not been completely legalised, those that do grow their own plants must keep their operation on the ‘down low’, which means access to cannabis is not exactly effortless and requires one to cleverly conceal what they’re actually smoking. At other times, there simply isn’t an abundant supply of cannabis available – the most logical thing to do, therefore, is to roll up a spliff. If you think about it, mixing cannabis with a few pinches of tobacco makes perfect sense, when you need to make your supply last longer. Also, since really good quality cannabis is hard to come by in the UK, even the most avid of users must make do with average-poor quality plants. Adding tobacco can help mask the impurities and generally bad flavour. Apart from the UK, spliffs are also commonly smoked in other nations throughout the EU, for rather similar reasons, it should be noted. No matter how you look at it, a spliff is a smart and savvy way of consuming cannabis, especially when you’re looking to make your supply last longer as you squeeze every last half a gram out of it. If you’ve ever smoked a cigar or even seen one up close, then you may already know what physical attributes a blunt has. Blunts generally contain ground up cannabis buds which are wrapped in tobacco paper – the same thick paper used to roll up cigars. You may have noticed how blunt smokers tend to purchase cheap and easily available cigars at the local quick stop or mini mart, like those Habana or Hamlet ones; these are useful for emptying out the low-grade tobacco and using the thick cigar paper as a blunt wrapper. All you need now is a little ground cannabis to fill up the outer shell of the cigar with it, give it a little twist for added measure and start puffing away. In fact, some brands of cheap UK cigars are now sold very commonly, simply due to how useful they are for blunt smokers. And when you see some of the ‘store regulars’ buying a large amount of cheap cigars, you can bet the store clerk secretly knows what kind of ‘mileage’ those cigars will be getting! It can actually be an awkward exchange to witness, because of the somewhat silent understanding between store clerks and cannabis users. Anyhow, blunts are 100% packed with cannabis only and do not need to have any tobacco mixed in, for the most part. And this is why cannabis purists love smoking blunts as they don’t want anything contaminating their fresh herb. In addition, we’ve also observed how some folks love to have blunts rather than spliffs because the cheap cigars they purchase to roll up that blunt, often come in a variety of rather tasteful flavours, which certainly add an interesting element to the already pure tasting herb. In What Parts of the World are Blunts Common? 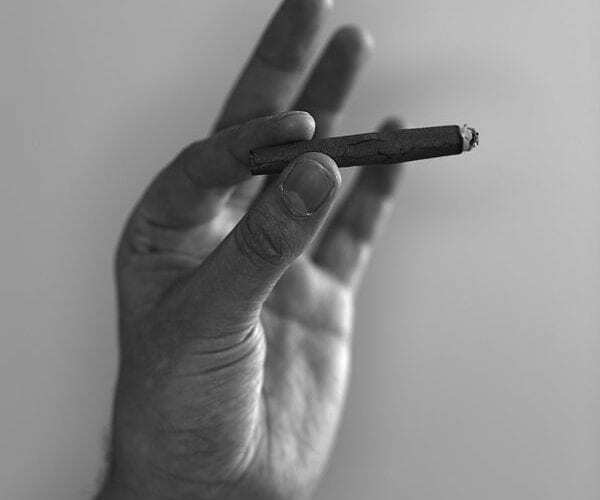 Blunts appear to be a common part of cannabis users’ vocabulary – particularly those residing in Canada and the US. You might come across lots of gas stations and quick marts packed with White Owls and Swishers – cheap cigars ready to be purchased in bulk by the next cannabis purist that walks in. In contrast to spliffs, making a blunt does not share the same 50/50 herb to tobacco ratio, because during the course of making one, you’re going to need a serious amount of cannabis. Blunts are, after all, nice and thick by the time you’re done rolling them, courtesy of all the herb that’s packed inside it – in fact, this is part of the reason why they’re so popular for being shared around in a circle at parties and social gatherings. You’re also going to find blunts to be a popular way of smoking cannabis in regions where it is legal and easily available, and at a reasonable price too. The US is actually a popular spot for blunt smoking because so many states have ‘relaxed’ laws around cannabis use and also recognise it recreationally as well as medically. It shouldn’t come as a surprise to see, for instance, a group of Californians sitting back at a local ‘hangout spot’ and puffing away big blunts. The herb is fresh, high quality and legally available in stores and dispensaries. Spliffs Vs. Blunts: What’s Better for Me? In spliffs, the effects are mixed given the 50/50 tobacco and cannabis mesh, which provides for a stimulating and energetic high similar to that of caffeine. Blunts on the other hand are heavy hitters, owing to the tobacco paper and cannabis interaction, which is all cannabis. Spliffs – the cannabis to tobacco ratio can be varied according to user preferences. Rolling papers are typically made from flax, hemp, wood or rice pulp, which can be plain or artificially flavoured. Blunts – tobacco paper is fairly large in size which means a significantly larger cannabis quantity. Unique tobacco paper for blunts can be purchased separately, although many users prefer to hollow out a cigar. It should be noted that tobacco paper generally has a sweeter flavour. We sell our own rolling paper, which is made from natural hemp fibers. Spliff rolling papers generally burn quickly while the tobacco paper used in blunts is thick and, therefore, burns slowly. Spliffs are very common and share widespread popularity in European countries while blunts are popular in urban communities such as Canada and a number of US states. This question definitely gets asked a lot by first-time cannabis users: should I try a spliff first or a blunt? While there’s no ‘educated’ answer to this, because the choice comes down to purely personal tastes – both options have ground cannabis and vary from one another in a number of ways, as we’ve just discussed. Now, depending on your own personal preferences, and how potent of an experience you want to have, you might go with either one. We’re leaning a bit towards blunts, because frankly speaking, they just provide more of a kick. However, if you’re looking for a bit of the added ‘feel good’ nicotine buzz, then you might want to try out a spliff first. We hope this article has served as an information base to understand what a blunt is, what the experience is like, why so many people love consuming their cannabis this way, and how it stands out or rather stands apart from a spliff. No matter how you look at it, the choice is entirely a personal one, and both options make for an excellent way to smoke your cannabis.